Just when you thought it was gone, maximalism is back — and with it, the horrifying danger of US military action against North Korea. The recent Hanoi summit and subsequent events have demonstrated that the United States still thinks it can unilaterally disarm the DPRK. 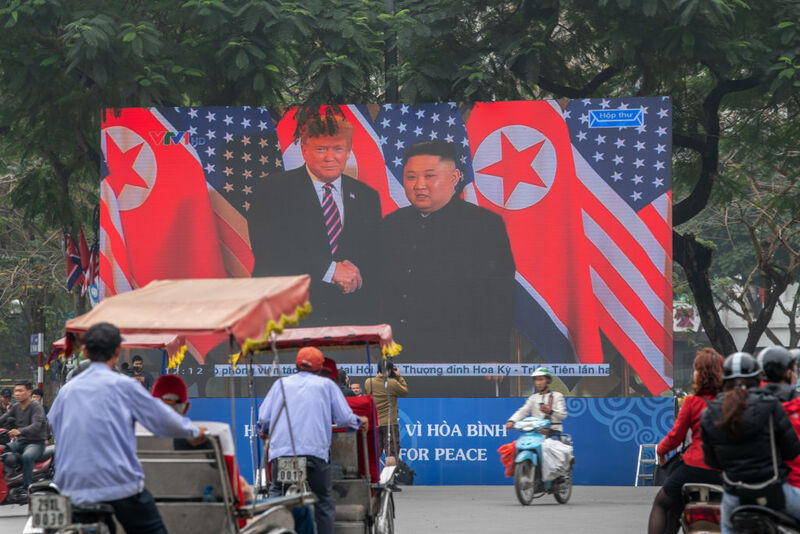 After weeks of cautious optimism, including tantalizing hints of a smarter diplomatic approach from the US, the Hanoi summit collapsed last month under the weight of the Trump administration’s ignorance and hubris. A different administration might see a failed summit as a reason to reevaluate its strategy. But the US has instead reaffirmed its deluded belief that North Korea can be pressured into total capitulation. This fantasy threatens to derail inter-Korean reconciliation and undo the dramatically improved relations between the US and DPRK. If left unchecked, it could even lead back to the ominous threats of 2017, when a new Korean War seemed far too close for comfort. The Hanoi summit’s failure was particularly jarring because in recent weeks, the administration appeared to be moving toward a more constructive negotiating position. US special representative Stephen Biegun delivered an address at Stanford University that seemed to signal a new flexibility on the part of the US. Biegun’s speech also stressed the importance of changed relations for denuclearization and emphasized Trump’s desire to finally end the Korean War. A February 26 Vox report on the outlines of a prospective deal offered further evidence that the administration was changing tack. The deal called for closing the Yongbyon facility (where the DPRK makes plutonium) in exchange for an end of war declaration from the US, the opening of liaison offices in Washington and Pyongyang, joint remains recovery operations in the DPRK, and sanctions relief to facilitate inter-Korean economic projects. The potential accord was surprisingly measured, fair, and could have easily served as a stepping stone to a larger agreement. Unfortunately, it disappeared without a trace. Details on the summit’s failed discussions are still trickling out. What seems clear, though, is that Trump’s initial claim that the North Koreans asked for all sanctions to be removed was completely false. It was so false, in fact, that the DPRK took the unusual step of convening a press conference in which Foreign Minister Ri Yong Ho explicitly outlined their position: the North proposed closing Yongbyon in exchange for the easing of five UN Security Council sanctions imposed since 2016, particularly the clauses impacting North Korea’s civilian economy. The US likely viewed this as a steep request, since those five sanctions form the backbone of the “maximum pressure” campaign — which the administration thinks has brought the North Koreans to the negotiating table. There were heated discussions at Hanoi about what the shuttering of Yongbyon actually entailed. The matter became so tense that it apparently threatened to undermine the summit. When the US asked whether closure meant dismantling the entire Yongbyon facility, Vice Foreign Minister Choe Son-hui ran to North Korean leader Kim Jong Un to determine whether that was correct. Kim confirmed that it was, which should have allowed the conversation to continue. But instead of responding with a reasonable counter-offer (drawing down fewer UNSC sanctions, for instance, or green-lighting waivers for inter-Korean projects), Trump and Pompeo slipped back into maximalist mode. They agreed to ease the sanctions only if the DPRK got rid of its entire nuclear weapons program (and likely its chemical and biological programs as well), a deal that essentially all North Korea experts agree is a complete non-starter. It is of course true that North Korea can be a stubborn and sometimes unfair negotiating partner. The DPRK’s resistance to working-level talks — where experienced diplomats hash out the details of complex agreements — is an obvious example. But the Hanoi reporting we have suggests that whether or not the North’s offer for Yongbyon was appropriately symmetrical, the Trump administration didn’t even attempt to negotiate for the facility. Pompeo and Trump instead returned to John Bolton’s bad-faith fantasy of total denuclearization up front — and the summit, unsurprisingly, fell apart. Rather than learning its lesson, the Trump administration has doubled down on maximalism in the wake of the summit fiasco. Biegun, once considered a pragmatic voice, declared before much of the D.C. nuclear policy world last week that the administration would never drop the sanctions before complete dismantlement. When an audience member asked what the administration could offer instead of sanctions relief, Biegun gestured toward economic incentives but largely dodged the question. His position throughout the appearance was hard-line and basically indistinguishable from John Bolton’s, suggesting that the administration had reeled Biegun in (if his Stanford speech actually represented a departure from the old maximalism). North Korea has already expressed its disapproval of the US’s all-or-nothing stance — and may be flirting with satellite launch preparations to telegraph its openness to walking away from talks. Should the diplomatic window close, whether through US intransigence or North Korean provocation, the risk of conflict will return. The collapse of nuclear negotiations will also likely hinder ongoing inter-Korean talks, which could themselves fall apart in turn. The Moon Jae-in government’s joint development projects will be unable to move forward without sanctions waivers that the US will be loathe to approve if tensions rise. South Korea’s expressed willingness to once again play a “mediating role” is encouraging, but unless Moon is able to convince the US to back down from its hard-line position, a deal seems incredibly unlikely. The implications of collapsed talks are extremely worrisome, which is is what makes the foreign policy community’s relative approval of Trump’s Hanoi performance so disturbing. Reciting the mantra that “no deal is better than a bad deal,” members of Congress and much of the US foreign policy community have set aside their distaste for Trump to praise his tough stance. The hopes and fears of South Korea, supposedly an equal partner in the region, never seem to figure into the jingoistic consensus that the US can simply dictate the terms of an agreement. This imperial delusion is self-defeating and dangerous. One prominent dissent from this view came from nuclear weapons expert Jeffrey Lewis, who argued earlier this month that the North Korean proposal at Hanoi was the best the US could expect — and that Trump should have taken it. Looking back at the history of US-DPRK negotiations, Lewis writes: “Each time the United States walked, a lot of people in Washington promised that patience and pressure would produce a better deal than the one squandered. And each time they were wrong.” The foreign policy establishment, Lewis concludes, just can’t bring itself to deal with a nuclear-armed North Korea because that would mean admitting that its policies have been entirely unsuccessful. Lewis is right. The DPRK has had the bomb for more than twelve years. It has an extensive ballistic missile program, and in 2017 demonstrated a plausible capability to strike the United States. Acknowledging this reality doesn’t mean accepting it. But it does require revising near-term goals and adopting a more realistic approach to negotiations. Not doing so is a recipe for disaster. The smarter path forward, as experts and activists have been saying for months, is to focus on more manageable aims. The two sides should revisit their Yongbyon negotiations, preferably at the working level. Dismantling Yongbyon wouldn’t end the North Korean nuclear program, but it would constitute significant progress toward freezing it in place. An interim agreement on Yongbyon could form a basis for further negotiations and would allow inter-Korean reconciliation to proceed. It would also keep tensions as low as they’ve (thankfully) been since early 2018. However, this requires giving up on the pipe dream of unilateral disarmament. It means facing tough choices, like the prospect raised by Lewis that the North Korean proposal could be the best deal the US is going to get. With Boltonism ascendant, though, the chances for a pragmatic step-by-step process look increasingly dim. Advocates for peace should keep making the case for a smaller-scale deal, an improved relationship with North Korea, and the unceremonious firing of John Bolton. Otherwise, we may find ourselves in a rerun of 2017 — without the surprise happy ending. Do Democrats Want a War With North Korea?